While Barron is known for arcade and commercial equipment, they also know how to make a few things for home use as well. The Kenti is built specifically for residential games. 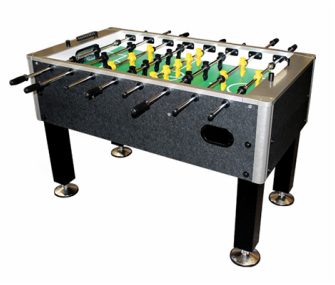 It has premium parts such as quality cabinet construction that can withstand heavy play. 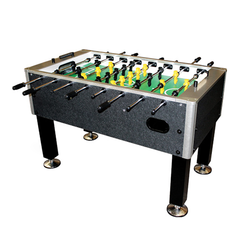 The sturdy steel legs and adjustable feet allow you to play on just about any flooring surface. 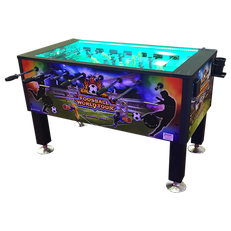 Barron Games also offers something unique in allowing you to customize the outside cabinet with your own business logo, making it a marketing tool and a great business investment for your office. This is smart considering the popularity of startup companies that want to have a game room available for their employees to relax and blow off some steam. This table is priced at about $1,400 US.